PureDWTS Cancellation Watch & POLL: Spring Season Out, DWTS Possibly Back Next Fall? ABC has renewed the competition show for Season 28, although it won’t premiere in the spring, co-host Tom Bergeron has revealed. Now here’s where I take issue, because they’re taking some of Tom’s tweets & IG comments and drawing some conclusions from them that I’m not sure we can safely make. 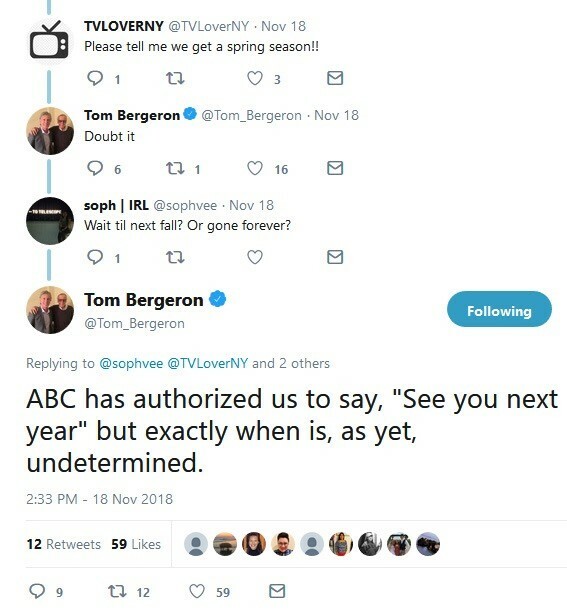 Reading through Tom’s tweets/comments, it sounds like he’s not been given specifics, only that the show will be back “next year”. He seems doubtful that it’ll be in the spring, but is “hopeful” about the fall; perhaps its my pessimistic side talking, but I think the higher-ups could be leaving “see you next year” a bit open-ended – could be referring to Juniors (if it gets renewed), or they might just be saying that for now, and might scrap DWTS if something better comes along. Nothing seems set in stone to me, but you be the judge. Here’s where I sit with the whole thing: I’m on the fence with skipping the spring season, as I feel like the gap between season 25 & 26 (and the shortened season 26) is partially responsible for the drop in viewership – let the viewers go too long, and they start to forget about DWTS and move onto other things. However, given that so many seem fed up with the show right now, I think it would do them well to give viewers some breathing room to start to miss the show again. I’m fine skipping spring season, as I mentioned before, because I doubt I’d have time to blog it this coming year 😉 If they are bringing DWTS back in the fall, I think they really need to focus on getting worthwhile stars that will draw viewers in, and possibly tweaking the format a bit – if there’s only going to be one season per year, a la SCD, they need to focus on quality. I’m hoping Juniors gets greenlit for another season, as I feel like that’s been a real bright spot this year – viewers seem to be enjoying it far more than they initially assumed. UPDATE, 11/21/18, 1:06 PM EST: A source came through and said DWTS has “definitely been picked up for the fall season, according to a BBC exec at the afterparty” and “still a maybe for a shortened spring season” and “juniors is a maybe for the summer season”. Source got the impression that spring season & juniors “will probably boil down to filling a spot” – basically, if they can’t find something else, spring & juniors will get greenlit. So we may not be completely out a spring season – but if we do get one, it’ll definitely be shortened. Something to think about. But what do you guys think? Let us know in the poll and the comments below.